Andranik Toros Ozanian, Zoravar Andranik (also Antranik or Antranig),(February 25, 1865 - August 31, 1927) was an Armenian general, political and public activist and freedom fighter, greatly admired as a national hero. Antranik Ozanian was born in the church quarter of Şebinkarahisar, Ottoman Armenia (present-day Giresun Province, Turkey). His mother died when he was one year old, so his elder sister Nazeli took care of him. Antranik finished the local Musheghian school and became an apprentice in his father's carpentry shop. After losing his wife and son at an early age, Andranik joined the Armenian freedom movement in the Ottoman Empire, and participated in various political parties, including Armenian Revolutionary Federation. He met the military commander Aghpyur Serob and joined his fedayeen. After the death of Serob (1899) he became the common leader of Armenian fedayee groups of Vaspurakan and Sassoun (Western Armenia). All of Andranik's lieutenants accepted that their leader possessed undisputed authority and superiority in military matters and that he was "primus inter pares" (the first among equals). Such was the popularity Andranik earned among the men he led that they came to refer to him always by his first name - even formally, when he later held a general's rank in the Imperial Russian Army. 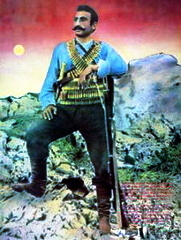 The death of Serob Paşa had caused many in the fedayee circles to seek a successor for the revolutionary movement. Andranik was soon elected for this position. Andranik's first mission was to capture and kill the perpetrators of Serob's murder. The person responsible was a man named Beshara Khalil, a Hamidiye, Ottoman Kurd soldier and chief of the Kherzeni tribe. Khalil was supported by the Ottoman government and was notorious for sacking Armenian villages and committing atrocities against the population. Khalil had killed Serop and placed his head on a pole to parade it in the squares of Mush and Bitlis. The aim was to terrorize the Armenian population and demonstrate to the Armenian revolutionaries the consequences of not submitting to the Ottoman and Kurdish Aghas unconditional tax demands. Andranik and his fedayees decided to devise a trap to kill Khalil. The road guide assisting Khalil's expedition was an ethnic Armenian. He became dismayed by the atrocities committed, and decided to inform Andranik of the direction he was leading Khalil. Andranik and his fedayees quickly created trenches alongside those roads. As Khalil approached, the Armenian guide gave a signal to the hidden fedayees. The battle began with Kevork Chavoush opening the first fire. They manage to kill two of Khalil's soldiers, while the rest scattered. As Khalil began to escape, his horse came alongside the trenches of Andranik. He opened fire and wounded the horse causing Khalil to fall. Andranik and his feedayes quickly captured him . Andranik told him, "Are you the one who killed Serop!" He did not reply. They then asked him a second time. Khalil replied that his time was already up, and that they may do whatever they wish to him. At this moment Andranik took his dagger, placed it under the neck of Khalil. However, Khalil was wearing a thick traditional Muslim scarf and did not die instantaneously. It is said that Kevork Chavoush took his dagger leading to the death of the wounded Khalil. In Khalil's pocket, the feedayes discovered the name of 40 Armenians that had been aiding Khalil's atrocities against the Armenians. Inside the list, was Rewez Aved, the Armenian who was bribed by Khalil to poison Serop. Andranik, Kevork Chavoush, Haroutiun (dies at Battle of Arakelots Vank), alongside with their feedayes set out to find the traitors. They eventually capture Reis Aved, and avenged Serop's death from all perpetrators. The most famous battles of Andranik and his fedayees in that period were the guerrilla battles of Arakelots (St. Apostles) Monastery of Mush (1901) and the Second Sasun Resistance (1904). Fellow revolutionaries that participated with Andranik during the battle of Arakelots Vank included: Kevork Chavoush, Seydo Boghos, Hajji Hagop, Haroutiun, and Ghazar. The out numbered Armenian fedayees and their victory against the superior Ottoman army resulted in a boost of moral for all Armenians across the empire. Thus, begun the process of elevating Andranik as one of the leading figures of the fedayees. After the Second Sasun Resistance (1904), Andranik and his feedayis were forced into exile by local Armenian authorities, and pressured from Armenian leaders to allow temporary peace in the highly violitle eastern vilx�yets. He passed through the Persian border, eventually arriving in Europe and published his "Military instructions" book in Geneva in 1906. At Sofia, Andranik met revolutionist Boris Sarafov, and the two pledged themselves to work jointly for the oppressed peoples of Armenia and Macedonia. 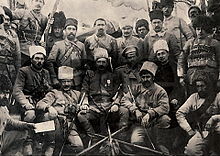 Andranik participated in the Balkan Wars of 1912-1913, within the Bulgarian army, alongside Garegin Njdeh as a commander of Armenian auxiliary troops in Macedonian-Adrianopolitan Volunteer Corps. Bulgarian authorities honoured him by the "Cross of Bravery". He retired to Galata, Varna, on the Black Sea, where he lived with his sister until the outbreak of the World War I. 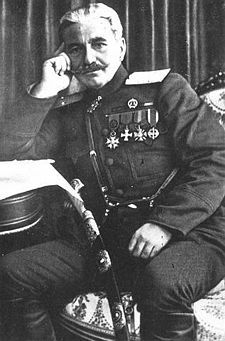 During World War I, he participated in the Caucasus Campaign and was appointed as general of the Armenian volunteer units of the Russian army. He participated in 20 different offensives where he gained fame due to his courage and the tactics he employed to defeat the opposing forces. The Russian authorities made Andranik a Major General in 1918 and decorated him six times for gallantry. The writer, intellectual and ARF leader Mikayel Varandian wrote about Andranik: "Not less courageous and not less capable than Serob Aghbiur, Andranik had both intelligence and instinct. A born strategist, with a thorough knowledge of the mountains and valleys of the motherland, he was a unique and unparalleled leader and commander. He was audacious and courageous, also cautious and farsighted". He was the commanding officer of the Armenian volunteer units, which helped the Van Resistance take control of Van on May 6, 1915. He helped re-capture the city from Ottoman forces during the Battle of Van. He was also the commander of the battalion that took the city of Bitlis (see: Battle of Bitlis) from the Ottoman forces that was under control of Halil Pasha. Between March 1918 - April 1918, he was the governor of the Administration for Western Armenia (The Armenian provisional government of a progressive autonomous region that initially set up around Lake Van). His military leadership was instrumental in allowing the Armenian population of Van to escape the Ottoman Army and flee to Eastern Armenia, then controlled by Russia. The territory later became the Democratic Republic of Armenia. "then Antranik did one of those things which so sharply differentiate him from a purely military chief. He gathered a great host of Armenian refugees about him - and anyone who passes through the Yerevan Republic today can see the horrors of Turkish wrought starvation from which he saved them - and trekked southward to the refuge of an impregnable mountain district. Accepting defeat, his one thought was for his people's safety." After the formation of the Democratic Republic of Armenia (DRA), he organized and fought alongside volunteer units to combat the Ottoman army. Andranik was leading his army in combat against the Ottomans during the signing of the Treaty of Batum, and refused to accept the borders stated by the treaty. As the commander of Armenian forces at Nakhitchevan, he "has protected in the name of the Armenian Army against the peace treaty with Turkey, and has declared that his army is determined to continue the war against Turks". His activities were concentrated at the link between the Ottoman Empire and the Azerbaijan Democratic Republic at Karabakh, Zanghezur and Nakhichevan. Ozanian struck back at the Ottoman Fronts, Army of Islam. Andranik tried several times to seize Shusha. Just before the Armistice of Mudros was signed, Andranik was on the way from Zangezur to Shusha, to control the main city of Karabakh. In January 1919 Armenian troops advancing, the British forces (General William M. Thomson) ordered Andranik back to Zangezur, and gave him assurances that a favorable treaty would be reached at the Paris Peace Conference, of 1919. In 1919 he left Armenia amid political turmoil and power struggles and went into exile in Fresno, California, United States. The New York Times reported, that among the passengers who arrived on November 22, 1919 from Havre on the French liner Savoie to ask US for a mandate "was General Ozanian Antranik, the hero of Armenia, who held out at Zangezour with a handful of troops against the Turkish Army until he was relieved on Dec. 13, 1918, by a British expeditionary force, more than a month after the armistice was signed, and saved 30,000 starving refugees". He was accompanied on the Savoie by General Jaques Bagratuni, Captain Haig Bonapartian, and Lieutenant Ter-Pogossian. In 1920, the Literary Digest described him as Armenia's "Robin Hood, Garibaldi, and Washington, all in one ..."
Andranik Ozanian lived in Fresno for 5 years until his death on August 31, 1927 at the age of 62. According to county records, he died at Richardson Springs, Chico, in Northern California. According to the New York Times, more than 2500 members of the Armenian community attended memorial services in Carnegie Hall for General Andranik Ozanian. His remains were originally to be buried in Armenia but Communist officials refused entry. His remains were then moved to the Px�re Lachaise cemetery in Paris in 1928, and eventually returned to Armenia in 2000, where he was buried at the Yerablur military cemetery. In 1995 Zoravar Andranik's Museum was founded in the Komitas Park of Yerevan. General Andranik (Zoravar Andranik), 1989, 18min. 35 mm.Director Levon Mkrtchyan.